The table and cover were both made locally to commemorate the lives of two Cowes men who contributed a great deal to the community. As you might expected during the week there are 8,500 sailors on the Solent waters, it was all go for the Cowes RNLI yesterday. The tonometer has been purchased for the department by the Friends of St Mary’s Hospital. Cowes RNLI joined forces with the crew of the Gosport lifeboat to carry out an urgent rescue of a 41ft yacht after the mast crashed down mid-Solent. 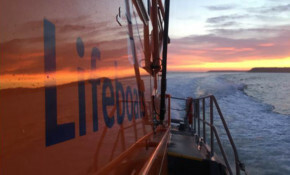 An event marking the 30th anniversary of the creation of the Cowes independent lifeboat service and the 10th anniversary of the replacement RNLI operation took place last weekend.